I played a round of golf today with my pop at his awesome country club. Rough life eh? It was lawn mower day out there so we found our share of chewed up golf balls. Since I had already shot a number much higher than my regular round I decided I’d do a small experiment. 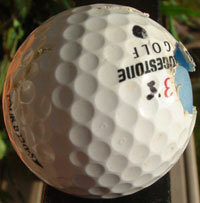 I often retire golf balls that have scuffs, scratches, dirt or other blemishes. I put them in the shag bag or use them on tight courses during heavy winds. I’ve often wondered how much damage a golf ball’s cover can have without seriously compromising it’s performance. On the 18th hole at the club I found this Bridgestone B330 ball (pictured). It had lost a battle with a John Deere. I played two balls from the tee on 18: one was a regular ProV1, and the other was the chewed up B330. 18 is a long par 5 with a severe upslope, especially at the green. Though it is only a little more than 500 yards, it plays much longer due to the uphill slope. I’ve reached this green in two once in my life after hitting TWO drivers. I hit good tee shots with both the V1 and 330. I cut the V1 slightly and hit the right rough. Surprisingly the 330 was fairly long and right down the middle. The ball flight didn’t vary at all! The V1 was about 10 yards longer. I hit each ball with a solid 3 wood (my TaylorMade r7 dual TP). I hooked each a bit because of the upslope. The V1 hit the left rough and ended up about 90 yards from the green. The 330 hit fairway about 100 yards out. This was where the big difference was. I hit PW with the 330 and it came up a bit short of the green. I hit SW with the V1 and ended up on the green but still short of the back pin. The 330 was about 20 yards shorter. I chipped the 330 with my PW and played a running shot. It ran out quite well and took the break of the green to end up 5 feet right of the pin. The V1 I putted past the pin to almost the exact spot as the 330. I sank both putts for a par 5. I lost a few yards off the driver and 3w, but the direction wasn’t effected much. The PW shot lost the most yardage because the ball had much more spin. With a big cut and chunk hanging off that 330, I thought it would hardly fly but I was wrong. So that makes me think that all those dozens of slightly scuffed V1’s, HX Tours, BlackMax’s and 330’s that are in my big ball bucket in the garage are still very playable. Mediaguru, I agree with you – as long as the ball doesn’t have serious scuff marks (ie like the image of the 330 you have above) the ball is still playable. What I’ve learned is on Par 3’s is where you want your best ball, in the best condition – the other holes don’t make that much of a difference, only a few yards. What you have to watch out for is the condition of the ball having an effect on the roll of the ball on the green. I need help with my upcoming golf trip, so while you’re reading this week’s links, think of ways to help me prepare.